Remember this post? 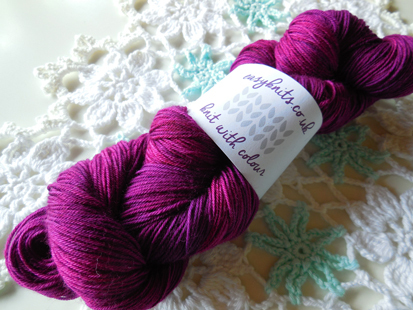 I treated myself to some luxurious lace yarn, because I passed the exam. 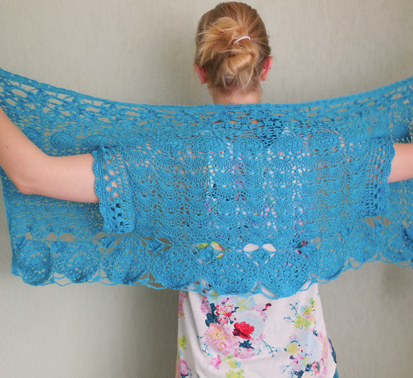 Well I’ve been crocheting a lace shrug from it, which took me about 4 months (!) to complete. It’s warmer than I thought, because of the silk and alpaca blend. I didn’t have a pattern so I made up my own. It’s basically a big rectangle with holes for your arms. 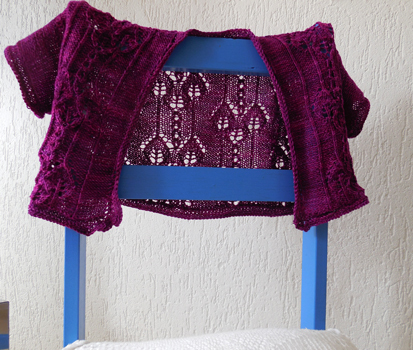 I joined it as I went, thinking up new motifs for every new row. 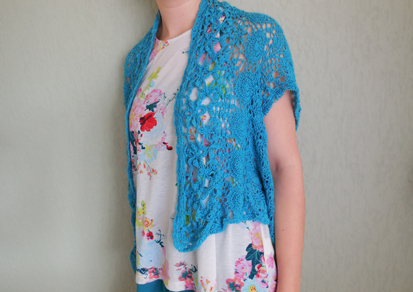 The only thing I used a pattern for was the middle section (where the armholes begin and end). I love the way it looks and drapes, but I’m not as happy with it as I thought I would be, considering the time I spent on it. The reason I don’t like it that much, comes simply from the fact that it’s already falling apart! I do know I don’t want to do join-as-you-go motifs with this kind of yarn anymore! Lesson learned. 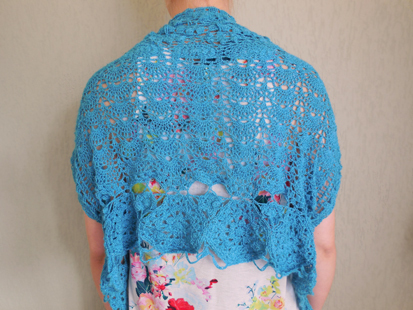 I fell in love with this one skein of yarn from easy knits. It’s from the deeply wicked range aptly called ‘purple queen’. Just look at that color! I didn’t want to make another pair of socks, so I quickly began exploring my options. I searched for shrugs, but most of them called for more yarn than I had, and I didn’t want to do anything stripy with another color. I saw a pattern which I’ve been drooling over for some time now, so I decided that I would use it to make a custom shrug. It’s the Carlina pattern by Kitman Figueroa. I love how the leafs come together in a heart shape. I made rectangles for the front and back, and picked up stitches for the sleeves and border. It’s really short, intended for a little layering, but certainly not for warmth. As you might notice I’ve gone a little heavy on the corner increases for the border. 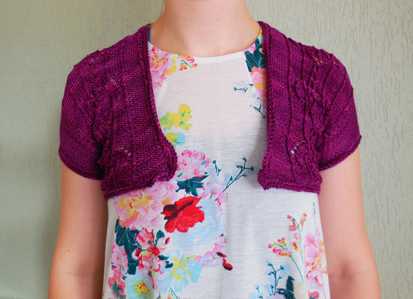 I’m planning on adding a ribbon to tie the shrug in the front, and gather that excess stitches. The pattern wasn’t hard at all, but there were times I didn’t pay attention enough and had to tink back a few rows. The stitches are just interesting enough to keep you going and all the purling that was done was not so much I would get sore wrists. 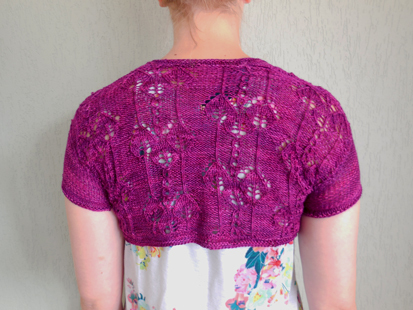 I’m glad I added at least one shrug to my garment repertoire, since I always love to layer. I don’t think one can have enough sweaters, vests, shrugs and bolero’s, don’t you agree?